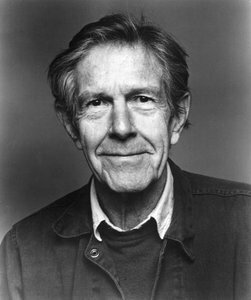 End is the fourth movement of Living Room Music which John Cage wrote in 1940. The whole piece consists of four movements, with the outer two movements To Begin and End written exclusively for “any household objects or architectural elements”. Standard Slowly Squared has three movements. The first movement is a false reminiscence of a1970s jazz/easy listening piece with a standard chord sequence and melody. The second movement slowly spreads out the chord sequence over 3 minutes and the third movement subjects the melody to an angular rhythmic process – rather like filtering a musical memory. In 1977, I wrote Sigma Variations for Sigma Trio (flute, clarinet and vibraphone). The opening 2-note idea had been given by Hugh Wood in the Morley College composition class for us to write a theme on. In 2009, I took Variation 3 from it (basically the theme, with chordal accompaniment) and used this as the opening and, varied, as the closing section of this new short piece. time folds is based on the above twelve words from a paragraph on distilling from The Periodic Table by Primo Levi. These words were used in an image I made [Red Earth (for PL)]. The words and the ‘ox-plough’ shape in it are the basis for this new piece. The music and the video were made at the same time, as two parts of the same piece. Earle Brown (1926-2002) was a major force in contemporary music and a leading composer of the American avant-garde since the 1950s. He was associated with the experimental composers John Cage, Morton Feldman, and Christian Wolff who, with Brown, came to be known as the New York School. Children’s Songs is an album of 20 keyboard pieces released by Corea in 1983. Here, no. 1 is adapted for violin and vibraphone. Chick Corea (born 1941) is one of the most prolific composers of the second half of the 20th century. He has cut a wide stylistic swath, from straight ahead jazz to avant garde, from children’s songs to hard-hitting electric fusion to grand orchestral collaborations. A 17-time Grammy winner, including a Latin Grammy, an NEA Jazz Master, and winner of numerous other international recognitions, the brilliant pianist-composer and bandleader is a tirelessly creative spirit and has been a true innovator and significant influence on the genre of jazz and beyond. One red rose that I mean is a song from the Beefheart album Lick my decals off baby from 1970. Played here is a version for violin and vibraphone. Captain Beefheart (1941-2010), born Don Glen Vliet, was an American musician, singer-songwriter and artist best known by the stage name Captain Beefheart. His musical work was conducted with a rotating ensemble of musicians called The Magic Band, active between 1965 and 1982. Noted for his powerful singing voice with its wide range. Van Vliet also played the harmonica, saxophone and numerous other wind instruments. His music blended rock, blues and psychedelia with free jazz, avant-garde and contemporary experimental composition. Terry Riley’s best known piece is probably In C which was written in 1964. Less well-known, and written just one year later, Tread on the Trail is dedicated to the jazz saxophonist Sonny Rollins. 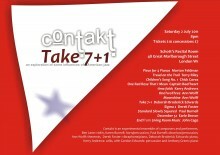 The piece is comprised of five melody lines which the performers play in unison and in free canon. The 2001 revision of Tread on the Trail includes a drone option and a variation for the fourth melody line. 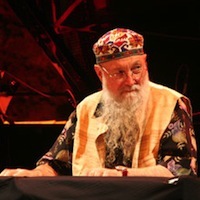 Terry Riley was born in California in 1935. He was involved in the experimental San Francisco Tape Music Centre with Steve Reich and Pauline Oliveros. During the 1960s were the famous “All-Night Concerts”, during which Riley performed mostly improvised music from evening until sunrise. When he finally wanted a break, after hours of playing, he played back looped saxophone fragments recorded throughout the evening. For several years he continued to put on these concerts, to which people came with sleeping bags, hammocks, and their whole families.